Here is a video I created to show how I mount laser prints on plywood. This is a way to create wall art that doesn’t break the bank but has a pretty edgy, cool look to it. I printed the photographs here in Santa Barbara at one of the local FedEx places. A black and white 8.5x11 print is $0.14!!! Doesn’t get any cheaper. And you can go up to 32” wide depending on the printers at your local FedEx office! Laser prints are cool because they have strong contrast and there is no ink that can bleed or fade. By no means would I consider these archival but I have some hanging in my house and studio that are over 10 years old and they haven’t faded! Laser prints became popular in the street art scene for wall pieces and murals and if you haven’t played with them, give ‘em a try. -modd podge glue and sealer (get it at Michaels or on Amazon). I like the matt option. YOU ONLY NEED A SMALL AMOUNT! This does take some practice and you’ll find your own ways of doing it but since it’s so cheap you can play quite a bit. I recommend doing a couple to figure out what works for you. Most important: Have Fun (and I hope you get some entertainment out of my instructional video…)! Here is another HD high quality cinemagraph I shot recently. It took me a while to figure out how to make these cinemagraphs HD. There is of course flixel but as far as I can tell they are putting out a video file instead of a gif. Making video files is easy to do yourself in Photoshop. The tricky part is to code the embed code to loop and autoplay. It is not as universal as a gif but rendering the cinemagraph as a high quality video file just makes it look so much better. We shot this HD cinemagraph in Santa Barbara. The creeks are all full of water these days so it was easy to find a pretty waterfall and put this together. Finding a good bookstore these days isn’t that easy. In Santa Barbara we can call ourselves lucky to have Chaucer’s, an amazing bookstore. During a stock photo shoot a little while ago we were in the area and so we stopped in and I took this image of the model browsing the collection. playing with a cinemagraph during a quick excursion to Nojoqui Falls. The trail was closed and we were told by the ranger not to disregard the closer since it was raining heavily and the hillside was in danger of sliding. Anyways, I set up the camera by the creek and took footage to create this cinemagraph. This is an HD cinemagraph as well. Not a gif. I created it in Photoshop and exported as a video file. Some creative embed coding later and here you have a high quality hd cinemagraph! The idea is simple: climb 29,029′, the equivalent of Mt. Everest’s elevation, in a skyscraper in downtown Los Angeles in one day. Obviously when one climbs the real mountain there is much less vertical elevation to deal with. But the lack of oxygen and exposure to the elements more than make up for that. Let’s just be clear from the beginning. Climbing Everest is much harder on every level. Still the idea is enticing so a group of nine men entered a very tall building in downtown Los Angeles one morning after driving down from Santa Barbara and got ready to ascend the 55 floors via the stairwell over and over… and over and over and over again. It would take 40 ascensions to make the 29K feet of elevation gain. There was also a cut off time since the building was shutting down and the security guards who had to be in the building wanted to go home. I was one of those nine men but I wasn’t there to reach the goal, I was there to document. To photograph the ordeal. Capturing the climbers required me to sit and wait in the stairwell for extended amounts of time and carrying my camera gear up the stairs didn’t help either. At the end of the day I did 10 ascensions and was perfectly fine with that. One of the unforeseen challenges that started impacting climbers was motion sickness. constantly turning right in the stairwell started really messing with them. To the point of puking. Not pretty but part of the game. Mid-day everyone had their groove going and in the early afternoon there was a scheduled break so that one of the climbers could propose to his girlfriend on top of the roof. This solid hour of break time would bite the remaining climbers (the newly engaged left after to celebrate) in the end. At 33 ascensions they ran out of time. They had climbed a respectable elevation of 24,000 feet. It’s always amazing when you find out something about your town that you had no idea about. Cue the Dos Pueblos Engineering Academy. Founder Abo-Shaeer and Emily Shaeer run a program that teaches high school aged kids all kinds of fantastic skills and knowledge in the greater realm of engineering. I was perplexed when I visited. The amount of resources available to students is fantastic. From CNC machines to computers, tools and of course most importantly knowledgeable help and not to mention space, lots of it! Teenagers were programming machines, writing code, building things and discussing projects within teams. I wanted to stay and join! 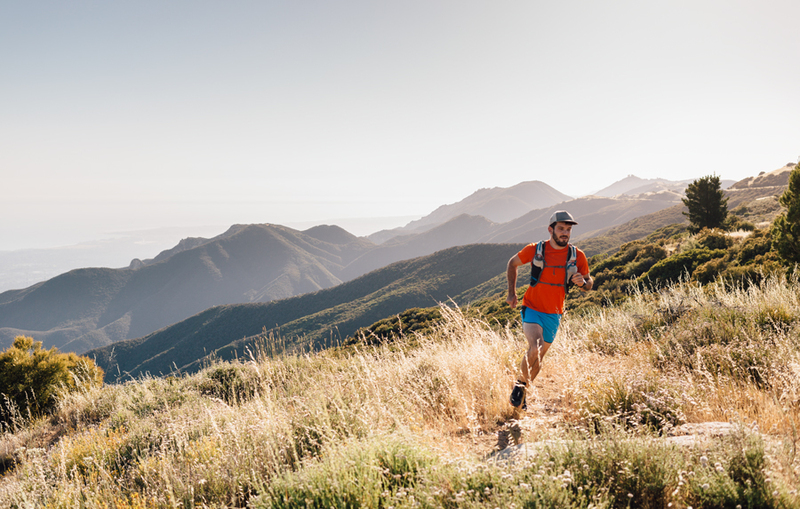 In addition to all the terrain, Santa Barbara also offers pretty ideal weather year round. Running in shorts and only a shirt is usually possible throughout the winter. All these elements combined make for a perfect backdrop to photograph running around here. I have been working closely with The Town Market here in Santa Barbara and part of what we have been doing is documenting (in this case taking portraits) of local people that are having an impact on the community. Das Williams came up and having run into him from time to time over the past decade I was excited to finally be able to photograph him. We met at his house and I found a spot to put up this blue background. I lit him with a Profoto monoblock but then also decided to use natural light for a variation. The above portrait is the natural light version, it worked well with the pastel colors of the background and his shirt. Shot on the 501cm Hasselblad and Kodak Portra 400 film. This was photographed for Naturally Danny Seo magazine and we only had a few minutes to figure it out. Holly was super sweet and after we played around with a couple of poses I took the above image and we were done. I lit this with a single Q-flash that was popped into the ceiling, off to the side. Nothing too precise but given the timeframe it was the best thing to do. There are some technical challenges to be considered when photographing with professional equipment in the water (and believe me I know all about technical issues. I once drowned $5000 worth of camera gear in a leaky housing off the coast of Tofino, B.C. during a shoot). But they can usually be solved with money. You just throw enough money at the challenge and it goes away. Not so with the practical challenges. You have to keep yourself above the water. But you are missing at least one arm and hand combo to aid with that since you are holding the camera. There are currents, waves, wildlife, all messing with you. Then you can barely frame through the viewfinder while trying to stay afloat. Changing any setting to adjust for exposure is a pain. There are drops of water on the front lens… the list goes on and eventually hits the point where you have to be cool with swimming where there might be sharks lurking. But all that makes for images taken in the water being just kinda special. Underwater or in-water photography has definitely become easier over the years but it’s still difficult to master. One of the portraits from an editorial shoot featuring Cisco Pineda of Cisco Brothers Sustainable Furniture. Photographed at Cisco’s house in Pasadena. I first met and photographed Constantin, or Conna, at his house when he must have been no older than 16 and then a year later at the old NSA surveillance station on the Teufelsberg in Berlin. A relict from the cold war built on top of the rubble from world war 2, dramatic but to the Berliner: just another piece to an insane puzzle. After that second shoot a few years went by but for the next one we booked a studio in Berlin and spent a day. We played around for hours. I went from one lighting set up to the next and from dark to light, inside to outside, we changed outfits from casual to dressed-up to not dressed at all and towards the end a bunch of looks I can’t show here. I would say this shoot was definitely the most creatively unrestricted we ever did together. It would prove to produce the most powerful portrait I would take of Conna to date and likely ever. After that I would call him up every time I was in Berlin and we would shoot some portraits. At his house, him jumping on the trampoline in the backyard. He would make crazy faces or pose super serious. Me always trying to catch the vulnerable moments in between. We both share a love for Porsches and one year he had started to accumulate all these cars. I was excited but I also was worried because taking a portrait in front of a car is very difficult to pull off without it looking super cheesy. Especially since he was still young. It’s one thing to have an old man in front of a vintage Ferrari or something but a young guy in front of a 90’s Porsche is a tough one. Over all these years one image from that shoot in the studio stood its ground. It was obvious to me right away when I first saw it that this was a special portrait and it has remained as one of my favorite photographs I have taken. It’s one of these moments where he was sort of in between posing and relaxing. This photograph really pushed me towards shooting in this style and it is in my mind every time I take a portrait that has the potential to rival it. These images are from a commercial catalog photoshoot I photographed in Carpinteria for the Walking company a little while ago. Being a Santa Barbara based commercial photographer I usually have to travel for shoots so when the local jobs come through it’s always nice! I was on assignment for Naturally Danny Seo mag in northern Thailand and we were so close to the border to Myanmar that we crossed it for a couple hours one morning. We explored the border town and then went to a temple where this young woman was showing us around. She offered an umbrella to us but we didn't take it. After walking around for a little while with her following our every step I realized how the light colored floor acted as a perfect fill light so I asked her if I could take her portrait. She happily agreed! Jessica Iclisoy outside her Airstream on the California Baby farm in Central California. This was photographed on assignment for Naturally Danny Seo Magazine. We got to spend the day with Jessica on her farm and went through multiple looks while baking in the hot Central Californian sun. I photographed lot’s of portraits like the one above and a few environmental images of the Calendula. Fun shoot and Jessica couldn’t have been nicer! Jessica Iclisoy amongst her calendula plants on the California Baby farm. This was shot in the Guadalupe dunes in Central California. There is just something about the clean lines and perfect surfaces of dunes that make them such a fantastic environment for photographing. Especially when you contrast them with a person. I shot this portrait of a rice farmer during a travel assignment for Naturally Danny Seo Magazine in Sri Lanka. This man was just walking up and I gestured to him that I’d like to take his portrait so he stopped and I snapped this image. I was on a walk with my wife one day and my phone rang. I usually don’t pick it up in this situation but for some reason here I did. The voice on the other side goes: Hi, this is Amy Smart! I grew up in Germany and I always loved Amy but of course only knew her from the screen. And here she was on the phone! I ended up shooting images for a commercial project of her husband and her’s but I built-in a request to take a portrait. So for about 10 minutes in between shots I got her in front of a cream colored backdrop my assistant had put up just outside her garage. It was open shade and soft light. I wanted her to sort of melt with the background with her blonde hair and fair complexion. I also shot color negative film to further this blending effect. I only shot two rolls of film I think. She kept looking to the side, just off camera and I didn’t quite know if she did it intentionally or not. We were comfortable with each other at this point so I ruled out that she was messing with me and I just went with it. It created these moments that were powerfully clean and yet vulnerable. Then she did this little smirk and I pressed the shutter. That portrait has some vulnerability to it but the smirk and the gaze to the side keep her in control. I was happy and we returned to the job. Over the years Kyle and his family had become good friends. I documented a personal challenge that he was part of, stand up paddle boarding across the Santa Barbara channel, a 26 mile adventure. Other adventures and evenings around the dinner table followed. I photographed him working out in the off season but I had never taken a proper portrait of Kyle. He is rather private and I wanted to respect that. It got to the point though where I just couldn’t hold back so I asked for a short session in my outdoor studio. For what I had in mind there is only a 20 minute window of the light being right. That window is towards the end of the day, right around sunset. I built the studio to face north and direct light is not really the issue but right within those 20 minutes it just looks right. Anyways, there wasn’t a lot of time since I was also photographing Kyle’s wife. Kyle is tall. I am not. And shooting with the Hasselblad I lost another couple inches since I was looking down into it. So I was scrambling to gain some height with the help of apple boxes. We are comfortable with each other but he is not an extrovert so I was trying to find the moment, the opening. I chose a wider angle lens so I could get pretty close and gain access just by proximity. It’s hard to disregard something within 2 feet from your face. I also used a diy light panel so I was able to control the light on his face very precisely. I shot a few frames with my Fuji XPRO2 from a little further away and got what I would call a very clean and safe shot. It’s good but then I also added another light to the background that created a very random shape. I went back to the wide lens on the Hasselblad and I got this portrait that wasn’t so safe. Kyle had just come out of the NBA finals arguably bruised and this shot captured his state of mind a lot better. Vulnerable and under scrutiny but strong amongst a chaotic scenario.